"I believe there are no madmen in the EU. [Previously the EU deployed peacekeepers] only in situations in which, as in the Balkans, all sides of a conflict agreed to it. The EU would never go to any region – be it southeastern Ukraine or anywhere else – unless the conflicting sides agree to such a mission," Lavrov said in an interview to Rossiya 1 channel's Sergey Brilev on Saturday. Russia's foreign minister added that Kiev should talk to the self-proclaimed Lugansk and Donetsk People’s Republic rather than Moscow to secure their backing for peacekeepers and not ignore them as it is doing at the moment. Moscow has previously criticized Kiev's unilateral invitation of a police force under the EU aegis for a peacekeeping mission in war-torn eastern Ukraine, saying the move undermined the Minsk ceasefire agreement because it wasn’t agreed by the rebel forces. On Monday, President Petro Poroshenko submitted a draft address to the UN Security Council seeking the deployment of an international mission to Ukraine, with the document already having been approved by the Ukrainian Security Council. Moscow believes that by trying to have foreign troops deployed in the country, Ukraine is acting against the Minsk-2 deal agreed in February. 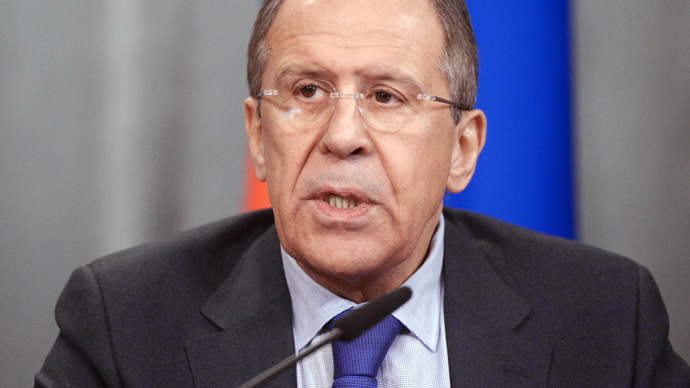 Proponents of a military solution can be found both in Kiev and Washington, Lavrov said. The two capitals practically speak in one voice when it comes to the Minsk agreement. “As far as we know, the Americans give lip service to the Minsk agreement… but put much effort into interpreting the agreed documents and their position is then voiced verbatim by Kiev,” he said. The top Russian diplomat confirmed that Moscow has called on Germany and France, which co-sponsored the Minsk agreement, to take action regarding Kiev's non-compliance with the peace deal. "We call for self-evident things: for action to be taken to make the Ukrainian authorities carry out obligations that have been backed by Petro Poroshenko as the president of Ukraine," Lavrov said. In his interview, the foreign minister also gave a reminder that the EU has recently acknowledged the Ukrainian crisis is a European problem, and no "overseas" interests should be involved in its settlement. In his speech to the European Council on Thursday, the president of the European Parliament, Martin Schulz, said the EU "has worked towards a peaceful solution of this conflict in our immediate neighborhood," and called a political resolution to the crisis "the only viable solution." "The [whole] Minsk process is based on a philosophy, recently voiced by the European parliament head Martin Schulz, who said that the crisis in Ukraine is not a Russian-American problem, but a European one, and should be treated that way... the EU wants to deal with problems at its borders in keeping with its own interests, rather than someone's across the ocean,"Lavrov said. “I feel sad that tantrums and Kiev’s unwillingness to compromise is just blocking the implementation of the agreement, which we all saw as good and implementable,” he said. Lavrov also blamed Kiev for trying to sideline the mission of the Organization for Security and Co-operation in Europe (OSCE), which has been tasked with monitoring the implementation of the Minsk ceasefire, by falsely claiming that it is not up to its task. "The mission has significantly improved the quality of its reports, they've become more regular. We insist that the reports were delivered on daily basis and they were distributed straight away to all OSCE member countries, rather than being sent to Vienna to be edited and 'dressed'," Lavrov said. The OSCE mission’s initial 500 staff positions are almost filled, and Russia successfully advocated for the ceiling to be doubled, Lavrov said. The OSCE already has high-tech equipment necessary for the task, including drones provided by Austria. Moscow is also ready to provide more technical assistance to the mission, including more drones and armored vehicles, although this would probably require settling formalities to have military personnel like drone operators attached to the civilian OSCE mission, he added. The minister went on to say that apparently Kiev is not happy with OSCE reporting because it shows the Ukrainian military in an unfavorable light. “The facts reported to OSCE members bear out that roughly 80 percent of incidents, such as failures to pull back troops or give observers access to areas they want to visit, are due to the actions of the Ukrainian military,” Lavrov said.